Our field trip continues as we travel to the island archipelago of Penghu with Yannick Dauby, the deep jungle of central Africa with Visions Congo (Gonçalo F Cardoso) and the monasteries of the Tibetan mountains with Soundwalk Collective and Francisco López. The recordings are impressionistic, using collage to portray their subjects and convey soulful sonic meaning. Yannick Dauby‘s 咾咕厝 Ló-kó͘-chhù is the second part of the Penghu Experimental Sound Studio series. The LP combines field recordings with improvised electronics and children’s narration from the film Childhood of an Archipelago (Yannick Dauby and Wan-Shuen Tsai). On initial play, one yearns to understand what the children are saying. But on subsequent spins, their words become part of the soundscape, rhythmic in cadence and relaxed in tone. One imagines the archipelago through sounds natural and human, while intuiting a childlike peace. The highlight of Side A is a rainstorm that whips through at 11:52, sweeping all words away; the highlight of Side B is a cacophony of livestock whose braying overwhelms the crickets, drums and even motorbikes. From this the listener may interpret chapters of the recording, night and morning, along with the overlap of certain scenes. In this scene, beeping does nothing to silence the livestock or (we surmise) get them to move. Even the roosters remain on their own schedule, unaffected by human activity. The shift back to crickets ~ now with human song ~ underlines the dreamlike quality of the recording. The places we visit are simultaneously the location, the memory and the impression, a point underlined by Dauby in this creative set. Mulago Sound Studio is the latest effort from Discrepant owner Gonçalo F Cardoso, whom some may remember from A Study into 21st Century Drone Acoustics. This time around, the sound artist appears as Visions Congo, an apt moniker given the genesis of the recording: visits to Uganda, Tanzania and Zanzibar. Like the previous recording in this article, Mulago Sound Studio is an aural collage, this one a bit more obvious as Evan Crankshaw’s cover art gives it away. 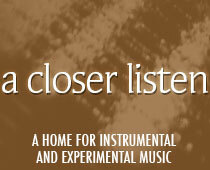 The listener is told to expect “some surprise insertions”, and the album does not disappoint. The record is rich with variety, from the opening moments (in which that giant gorilla seems to embark on a tempo-driven duet with the little people below) to the music of an old reel-to-reel film. More than anything, Cardoso makes Africa sound fun, with thumb pianos, pygmies and frogs: a place anyone with a pith helmet would love to visit. This is the stuff of adventure stories, striking a balance between the beauty of nature and its omnipresence. As long as the human residents and visitors live in harmony with the jungle, their presence will be tolerated. In this case, they respond with joy. So is this really what the jungle sounds like? No, except in parts ~ but to Cardoso, this is what the jungle feels like. This is the antithesis of Kong: Skull Island, an oasis of color and sound. Even the radio preacher sounds benign, in contrast to the one heard on Crow Versus Crow’s States (see Monday’s article). If one thinks of Deep Forest while listening, it’s only because that group’s dance floor homogenizations attempted to define the Congo for future generations, before becoming a cliché of itself. Mulago Sound System plays with clichés, winking fondly while creating what one hopes will be a more indelible memory.